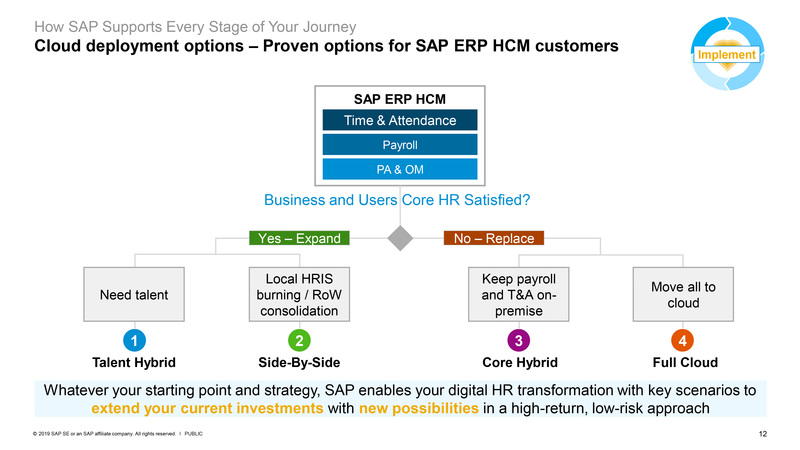 Reviewing the journey and options for customers as they migrate from On-Premise SAP HCM and Payroll to SAP SuccessFactors and the cloud. Senior Vice-President of HCM Solutions Danielle Larocca has worked in the SAP HCM space for over 20 years. An SAP Mentor and featured speaker at numerous conferences, Danielle has authored four best-selling books on SAP, is the Technical Editor for the SAP Professional Journal, and often the Voice of the Expert on SAPInsider’s Ask the Expert series for HR. There was a long stretch of time where it was ‘business as usual’ for SAP HCM customers. Although some innovations were added, the core functionality for HR and Payroll largely stayed the same, as shown in the picture below. In late 2011, SAP acquired SuccessFactors which, at the time, was then the second largest cloud-based software solution next to Salesforce.com, with more than 6,000 customers and over 32 million users in 60 industries in over 185 countries. In 2012, SAP announced to its approximately 13,000 on-premise SAP HCM customers a planned movement to the cloud and a planned future cessation of its On-Premise HCM applications, including Payroll. When initially announced, customers were encouraged to journey to the cloud, adopting the SAP SuccessFactors cloud versions of the HCM solutions. SAP announced that customers had two landscape options to choose from: On-Premise SAP or Cloud, as included in their annual Roadmap update slide below. This is not a simple swap of modules, but rather a shift from a customized system to one designed leveraging standardization and best practice. In the early days since the acquisition, it was announced that partners would be leveraged to handle any functionality not currently available in the SuccessFactors solution, as shown below. To explain how this missing functionality would be addressed, SAP shared the slide below showing that key pieces of functionality not available in SuccessFactors could be obtained via integration with Partners including Benefits and Time and Attendance Management. The first customers to make the transition from SAP to SuccessFactors often did so focusing on the Talent modules (Recruitment and Learning for example), as their reputation for performance, user experience and success outweighed their SAP On-Premise counterparts and were often based on best of breed solutions. SAP also encouraged customers to start with an existing pain point in their organization which often concerned these talent areas. Because of this migration to the talent modules, SAP created a new landscape model called the Talent Hybrid to categorize these customers as part of their cloud revenue. SAP then had three options: Customers were classified as On-Premise SAP, Full Cloud or the Talent Hybrid model, as shown in their Roadmap update shown below. This Talent Hybrid scenario accounted for those customers who still used SAP On-Premise for core HR but moved at least one Talent module to the cloud. The adoption of cloud technology appeared to be slower than anticipated after its announcement in 2012, and the guaranteed support date of year-end 2015 date was extended to 2020, and then extended again to 2025. In 2014, a fourth model was added to account for customers who kept their SAP HCM On-Premise but who also deployed SAP SuccessFactors Employee Central for at least one division or region or country in their organization. This new landscape model was called Side-by-Side (originally called two-tier), as shown in SAP’s Roadmap update in late 2014, shown below. This model allowed companies to keep their beloved SAP On-Premise solution as is, while using SuccessFactors Employee Central for new implementations of smaller regions or divisions giving them the opportunity to see the full power of the SuccessFactors Employee Central solution. At the conclusion of 2014 there were four options for customers: On-Premise, Talent Hybrid, Side-by-Side and Full Cloud. The migration of SAP’s existing HCM customers, however, continued to be slow. I suspect much of it had to do with the perceived loss of functionality of moving to Employee Central or Employee Central Payroll, because a few of the core modules in SAP were not yet available in SuccessFactors, and customers had to leverage partners for the missing functionality like Time and Benefits. SAP SuccessFactors has made progress on this including the launch of Employee Central Time, and as of 2019, SAP now details which functionality is available within SAP SuccessFactors and which is managed via a partner integration as shown in the slide below. New customers, not currently on the SAP HCM platform, began implementing SAP SuccessFactors Employee Central. However, a large majority of existing SAP On-Premise customers opted not to move away from their On-Premise core HR, which I suspect is because they did not wish to move their Benefits and Time systems to new integration partners. Additionally, SAP’s On-Premise Payroll customers were confused about what moving to SuccessFactors Employee Central Payroll would entail. Let’s take a moment to talk about Employee Central Payroll. It appeared that SAP’s approximately 9,000 On-Premise Payroll customers were most reluctant to move to the SuccessFactors version of Payroll. I speculate that there are many explanations for this, including the large investment many companies made to customize their On-Premise Payroll, the detailed complexities of its integration with other systems for the processing of Benefits and Time, and their concerns about the overall maturity of the cloud counterpart referred to as SAP SuccessFactors Employee Central Payroll. 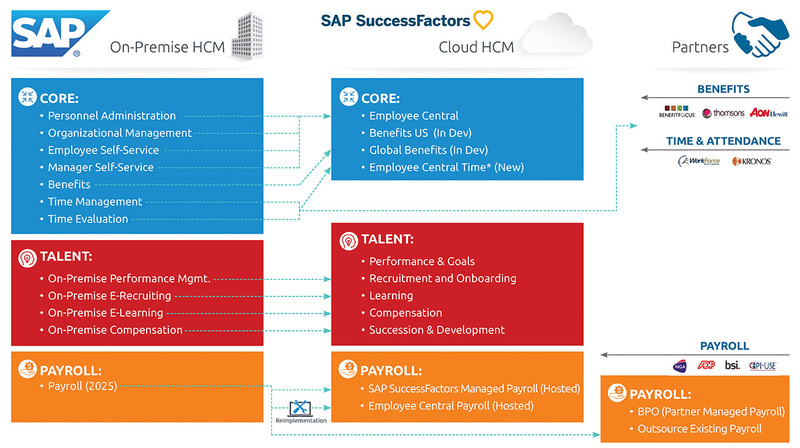 Part of the confusion is that SAP SuccessFactors Employee Central Payroll is not a new payroll solution; rather SAP has leveraged the existing world-class multinational SAP On-Premise Payroll and has transitioned it to a ‘hosted Cloud’ environment. The core engine of Employee Central Payroll is the same as the SAP On-Premise payroll engine; however from a development, support and licensing perspective it is designated as a separate product. Anyone familiar with SAP, including SAP Payroll, knows that SAP has been a system that is completely customizable, and each customer has painstakingly designed the system (including its time and benefits functionality) to support their unique business processes and needs. This often translates to many customizations, user exits, custom infotypes and objects etc. In contrast, however, in line with the overall Software as a Service (SaaS) mentality, SuccessFactors is based on a best-practice methodology which is not designed to necessarily accommodate unique customizations. This would mean that existing SAP On-Premise Payroll customers wishing to move to SAP SuccessFactors Employee Central Payroll not only needed to implement partner technology, like Workforce for Time data and Benefitfocus for benefits, but they also would need to reimplement and streamline their SAP Payroll to align with a higher level of standardization compared to the On-Premise payroll solution. For example, customers moving to Employee Central Payroll are not permitted to make core modifications or changes to enhancement spots. At the end of 2018, the marketing has since shifted to say that the ideal customers for Employee Central Payroll are often those organizations with greater than 5,000 employees without complex time or benefits processing. 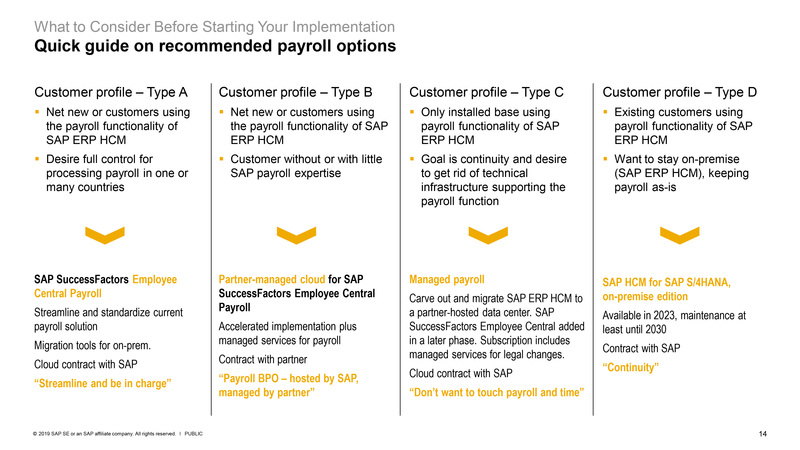 Existing SAP On-Premise Payroll customers wishing to move to SAP SuccessFactors Employee Central Payroll must complete the five steps below. 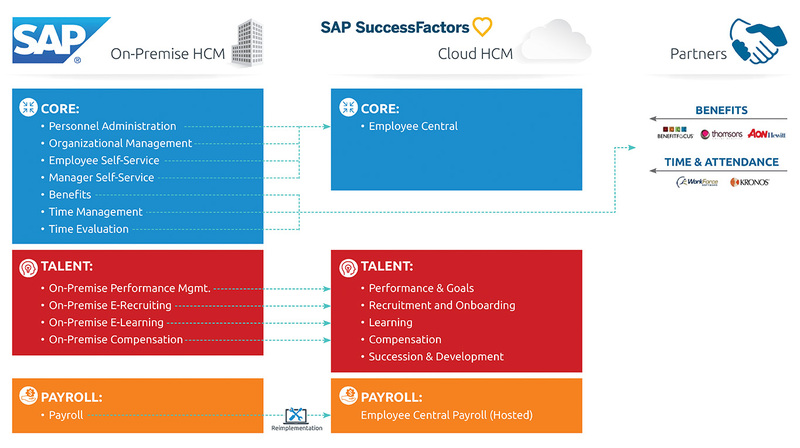 Why move to SAP SuccessFactors Employee Central Payroll? One of the primary motivations for movement to the cloud is to eliminate the need for a company to maintain its hardware and software and manage local installations of client server-based technology. Customers who elect to move to SAP SuccessFactors Employee Central Payroll are essentially leveraging that benefit from the cloud by allowing SAP to host their SAP database on a server for them to access via the internet. Another benefit of the SuccessFactors’ thinking is the adoption of best practice in the design of all aspects of human capital management, which often requires a standardization of processes to a certain extent. Standardization is not often the word that comes to mind when you think of SAP Payroll, as it is often one of the most customized modules in the SAP landscape. Most On-Premise SAP core HCM solutions are customized to a large extent, to satisfy each organization’s unique individual business needs. SuccessFactors, particularly its core component of Employee Central, does not follow that philosophy. Instead it is based on best practice. When this ‘Best Practice’ methodology was first explained in detail back in 2014, with Mike Ettling proclaiming that “…customization was a dirty word…”, many companies simply pumped the brakes and refused to abandon their large investments in On-Premise SAP Payroll. This confusion in the marketplace about Employee Central Payroll was exacerbated by some bad press from some in the SAP sphere, encouraging Payroll customers to do nothing and hold tight. (More on the topic of Payroll follows further on this page). It was at this point that SAP SuccessFactors added a new option to the mix, targeted specifically for Payroll. Added in 2015, the SAP SuccessFactors Managed Payroll offering was created to address the needs of customers that made a large investment in their SAP Payroll who wished to start their journey to the cloud but did not want to make any changes to their SAP On-Premise Payroll. In my opinion, this new deployment and license option was created because movement to the cloud was slower than expected overall, and that reluctance was often driven by the approximately 9,000 Payroll customers who did not wish to re-implement and/or simplify their existing payroll while also building integrations as needed for partners for any missing functionality like Time or Benefits. This new option, SAP SuccessFactors Managed Payroll, addressed the needs of customers that had made a large investment in their On-Premise SAP Payroll who do not wish to change it; however, they wanted to start their journey to the cloud. This model allowed customers to make no changes to their existing SAP Payroll system or its processing. They simply allowed one of two certified partners to host it on their server. Because it is hosted on their server, it is considered a ‘hosted cloud’, just like the SAP ‘hosted Cloud’ option for Employee Central Payroll. The significant difference in this scenario is that customers did not have to make any changes to their customizations or their use of their existing Time or Benefits modules, and most importantly no reimplementation was required. That vendor will lift and shift that payroll, as is, to the “hosted cloud”. The licensing for this option was done solely on SAP paper; however, the migration work is scoped directly with the selected vendor. This gives the customers the benefit of leveraging their On-Premise investment and all of its customizations while also enjoying the benefits of hosting and management in the cloud. EPI-USE Labs has performed many HCM carve-outs globally. This option, like On-Premise SAP includes guaranteed support through calendar year-end 2025, or 2030 for those customers on HANA. To account for this new model, SAP SuccessFactors offered a fifth landscape model called Core Hybrid, to the existing four: On-Premise, Talent Hybrid, Side-By-Side and Full Cloud. Customers then had at least three options for what they could do with their SAP Payroll, as detailed in the picture below. With five landscape options that evolved over a four-year period and three Payroll options, it’s fair to say that there was quite a bit of confusion in the marketplace. Adding to that confusion is that there are additional Payroll options available to customers which include working with a partner – often referred to as Business Process Outsourcing (BPO) – or even outsourcing the Payroll altogether either to a partner or another vendor as shown in the picture below. As customers evaluating these various options began their journeys to the cloud, many were still inquiring about the guaranteed end of support date of 2025 for the various options, as shown below. As customers either began their investigation or actually commenced their cloud journeys, there were no big landscape related announcements in 2016 or 2017. The guaranteed support date for On-Premise HCM was extended a couple of times giving customers ample time to migrate to the cloud. As mentioned earlier, I suspect that the largest resistance came from the approximately 9,000 Payroll customers who often asked SAP SuccessFactors to continue to extend the guaranteed support date beyond 2025. In January 2018 SAP SuccessFactors offered a new model, extending support for any existing On-Premise SAP HCM customer through calendar year-end 2030 if they upgrade any existing Business Suite license to SAP S/4HANA On-Premise. This brings the total number to six possible landscapes, as shown in the picture below. The new landscape option was titled the SAP HCM Side Car for S/4HANA or Side Car for short. To include this new offering, I have updated my landscape model overview to include all six payroll options as detailed below. I have also added new partners and modules updated over the years to provide a complete picture of the landscape for customers as it appeared in 2018. Ultimately, there is no one-size-fits all for SAP’s existing HCM and Payroll customers, as each will have their own requirements, roadmaps etc. to consider. 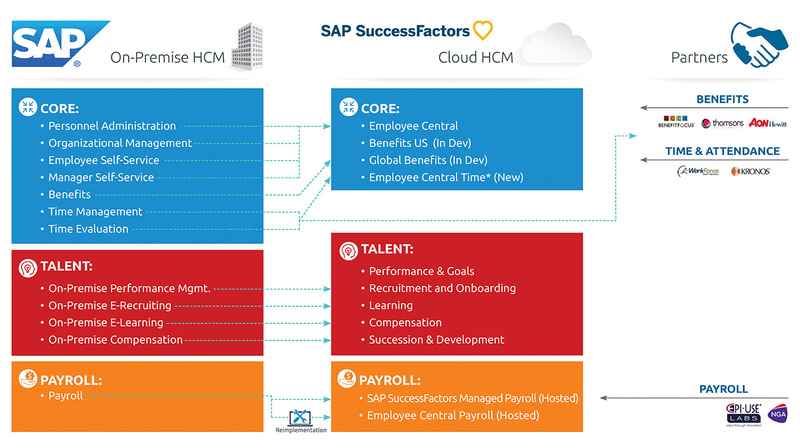 What you can be sure of is that SAP SuccessFactors will continue to adapt along the way to ensure that there is no interruption of your critical HR and Payroll processes, as they have to date, as shown below. More importantly, EPI-USE Labs is here to help you regardless of which journey you take. EPI-USE Labs solutions have universal value regardless of your landscape model to assist you in getting to an intelligent HR and Payroll. EPI-USE labs offers an On-Premise Payroll to SuccessFactors' Employee Central Migration Service called PRISM. PRISM is a boutique combination of proprietary EPI-USE Labs solutions and EPI-USE Payroll experts to migrate your existing SAP HCM On-Premise Payroll to SuccessFactors Employee Central Payroll (ECP). EPI-USE Labs has the proven software products including Data Sync Manager and Variance Monitor to facilitate a painless and automated migration whilst EPI-USE has the world’s best Payroll consultants to migrate the Payroll. The largest challenge for SAP On-Premise HCM customers is that multiple tools (Ad Hoc Query, SE16, Custom ABAP, Wage Type Reporter and others) are required to report on critical HR and Payroll data. Often this data is collected via these multiple tools and consolidated offline in an application like Excel, Access or BW, requiring a large amount of manual effort and consuming both valuable time and resources. This also poses security and data integrity risks as the data is taken outside of your SAP system. Query Manager™ solves this challenge. The brilliance of the Query Manager solution is that it provides access to all of the data users need in an easy-to-use format, so that end users can be empowered to create reports on their own, live in SAP, without reliance on technical resources. Employers send thousands of letters to employees each year including Benefits Confirmation Statements, Employee Paycheck Explanations, Total Compensation Statements, Annual Review Letters, Employment Contracts, New Hire or Offer Letters, Training Completion Certificates, Recognition Service Award Letters, W2 address confirmations etc. The creation of these letters is manual, time-consuming and error-prone. Document Builder enables you to design, generate and distribute professional HR documents automatically, live from your SAP HCM system. Variance Monitor gives you the ability to compare HR and Payroll data between systems and across periods. And because it’s automated, it eliminates manual comparisons, speeds up your processes and enables your managers and test teams to be much more productive. Data Sync Manager™ (DSM) for HCM empowers all SAP® HCM users to copy and scramble HCM production data in non-production systems for testing, training and support. DSM gives you the data you need, when you need it. This SAP-certified solution allows you to select and transfer specific HCM data objects easily and accurately, as needed, and to mask sensitive data for confidentiality, security and governance compliance. Your SAP HCM Data. Simplified. Available. Secure.